Pupillary distance, or PD, is the distance between your pupils when looking straight ahead. This is a necessary measurement for glasses to put the optical center of the lens right in front of your pupils, making the glasses comfortable and natural to wear. During your normal eye exam you can ask your doctor to measure your PD and to provide it on your prescription. Once you obtain this measurement as an adult, it will never change. In case your prescription does not have the PD written on it, most optical shops have a device with which they can measure your PD. This takes only one minute. Customer oriented shops will do this as a free service, or charge a small fee. So what do you do if your eye doctor has not provided this measurement on your prescription and/or refuses to give this to you? There are 3 solutions, only 2 of which we recommend. You can use our free online PD meter (recommended), rent a PD meter from us (recommended), or use a ruler (not recommended). We provide our customers with several ways to easily and accurately measure their PD. Using a ruler is a last resort option to measure pupillary distance. Using a ruler almost always results in inaccuracies (even opticians make mistakes measuring PD like this). Keep in mind, PD is measured in millimeters, which is a very small unit marked on a ruler. Also, parallax plays a huge role in wrong PD values. Parallax is the phenomenon where the distance between objects appears to change as your viewpoint changes. For example, imagine you're driving a car. When you look at the speedometer, you can tell that the needle is hovering right at 60. However, if your passenger looked at the speedometer at the same time, it may look like the needle is pointing closer to 55. The same thing occurs when you try to measure PD with a shift in your viewpoint. Particularly because millimeters are such a small measuring unit, mistakes are easily made. Our state of the art online PD meter measures your distance PD quickly and accurately. 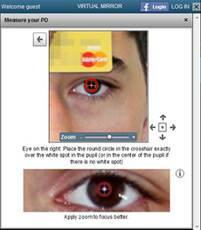 Instead of fumbling around with a ruler, why not measure your pupillary distance using our revolutionary PD meter? We spent a lot of time figuring out how to make everyone's life easier by measuring pupillary distance at home. The resulting PD meter is the first and only one of its kind online; a state of the art tool that measures distance PD just as accurately as an optician's PD meter. In order to use this tool, you must first take a picture to upload. Don't fret; this picture is very easy and only takes a minute to take! Instructions can be found here. We highly recommend that people who require multifocal lenses (such as progressives and bifocals) obtain a monocular PD value. Monocular PD is the distance of each pupil to the center of the nose bridge, and is written as 2 numbers. For example, in the picture below the monocular values would be written as 30/32. Remember that values for the right eye are always written first in the optical industry. Also, the sum of your monocular PD numbers are equal to your distance PD, which is 62 in our example. Monocular PD is the distance of each pupil to the center of your nose bridge. Whereas our online PD tool is very accurate for total PD, taking monocular values from a picture is a problem. The slightest change in angle of the head produces different values. As a better solution, we provide the option of PD meter rentals to our customers. Our Adnuo® PD meters are top of the line, and come with clear instructions. Upon checking out, you can elect to either rent or buy one on the Upgrades screen. 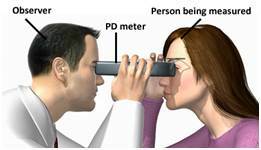 Remember that while you are in possession of the PD meter, you can accurately measure the pupillary distance values of your family, friends, neighbors, and colleagues. 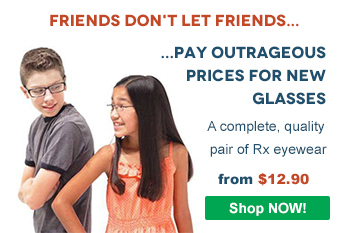 You probably want your progressive or bifocal lenses to work perfectly. Visio-Rx is the only website offering you easy access to a rental PD meter. Once you have your monocular PD values, these will not change during the course of your life.